Spark Therapeutics, Inc. (NASDAQ: ONCE) shares climbed 120.09 percent to close at $113.48 on Monday after Roche Holdings AG (OTC: RHHBY) announced plans to acquire the company for $114.50 per share in cash. Clementia Pharmaceuticals Inc. (NASDAQ: CMTA) gained 74.66 percent to close at $26.06 after the company announced that Ipsen would acquire the company for $25 per share in cash and up to an additional $6 per share depending on FDA acceptance of a new drug application for palovarotene. Planet Green Holdings Corp. (NYSE: PLAG) gained 4.197 percent to close at $4.2875. Uniqure NV (NASDAQ: QURE) shares rose 34.3 percent to close at $55.87. Cantor Fitzgerald maintained uniQure with an Overweight and raised the price target from $68 to $81. Shares of gene therapy companies are trading higher after Roche announced it would acquire Spark Therapeutics for $114.50 per share in cash. Phoenix New Media Limited (NYSE: FENG) climbed 31.94 percent to close at $4.75 after announcing a letter of intent to sell a 32 percent stake in Particle for $448 million in cash. The company also reported a strategic investment in Tadu. Titan Pharmaceuticals, Inc. (NASDAQ: TTNP) shares rose 30.5 percent to close at $1.84 after the company reported a partnership with AllianceRx Walgreens to expand patient access to Probuphine. China SXT Pharmaceuticals, Inc. (NASDAQ: SXTC) gained 25.45 percent to close at $6.31. CRISPR Therapeutics AG (NASDAQ: CRSP) shares rose 25.2 percent to close at $39.65. CRISPR Therapeutics posted Q4 loss of $0.92 per share on sales of $115,000. CRISPR Therapeutics and Vertex Pharmaceuticals disclosed that the first patient has been enrolled in a Phase 1/2 clinical study of CTX001 in severe SCD in the U.S. and is expected to be infused with CTX001 in mid-2019. X Financial (NYSE: XYF) gained 23.99 percent to close at $7.08. Libbey Inc. (NYSE: LBY) shares rose 23.88 percent to close at $4.41. AVROBIO, Inc. (NASDAQ: AVRO) surged 21.63 percent to close at $16.98 on Monday. Veritone, Inc. (NASDAQ: VERI) shares jumped 20.45 percent to close at $6.36. Stamps.com Inc. (NASDAQ: STMP) climbed 18.61 percent to close at $99.22 on a buy-the-dip rebound following a 50%+ decline on Friday. SPI Energy Co., Ltd. (NASDAQ: SPI) gained 17.15 percent to close at $2.80. Akcea Therapeutics, Inc. (NASDAQ: AKCA) surged 16.72 percent to close at $31.91 after the company announced Novartis licensed AKCEA-APO(a)-LRx; Akcea is set to receive a $150 million licensing fee that will be split with Ionis equally. Hexindai Inc. (NASDAQ: HX) shares gained 16.42 percent to close at $3.97. Aurinia Pharmaceuticals Inc. (NASDAQ: AUPH) rose 16.32 percent to close at $7.20 on Monday after the company received a notice of allowance from the US Patent and Trademark Office for claims directed to its novel voclosporin dosing protocol. Adverum Biotechnologies, Inc. (NASDAQ: ADVM) gained 16.22 percent to close at $4.3000. REGENXBIO Inc. (NASDAQ: RGNX) gained 16.17 percent to close at $54.02. Oasmia Pharmaceutical AB (publ) (NASDAQ: OASM) gained 15.28 percent to close at $2.8184. Neurotrope, Inc. (NASDAQ: NTRP) shares rose 14.89 percent to close at $5.17. Uniti Group Inc. (NASDAQ: UNIT) shares surged 14.84 percent to close at $10.60. Ocular Therapeutix, Inc. (NASDAQ: OCUL) gained 14.66 percent to close at $4.7700. bluebird bio, Inc. (NASDAQ: BLUE) shares gained 14.16 percent to close at $149.91 in sympathy with Roche's acquisition of Spark Therapeutics earlier Monday. Mmtec, Inc. (NASDAQ: MTC) shares gained 13.4 percent to close at $5.50. PPDAI Group Inc. (NYSE: PPDF) rose 13.32 percent to close at $5.02. Abeona Therapeutics Inc. (NASDAQ: ABEO) surged 13.29 percent to close at $7.33. Constellation Pharmaceuticals, Inc. (NASDAQ: CNST) gained 13.14 percent to close at $10.76. Cerecor Inc. (NASDAQ: CERC) climbed 13.06 percent to close at $6.06. Fuwei Films (Holdings) Co., Ltd. (NASDAQ: FFHL) rose 12.98 percent to close at $2.35. Fate Therapeutics, Inc. (NASDAQ: FATE) gained 12.83 percent to close at $16.27 on Monday. MeiraGTx Holdings plc (NASDAQ: MGTX) shares jumped 12.54 percent to close at $14.36. Zosano Pharma Corporation (NASDAQ: ZSAN) gained 12.11 percent to close at $5.09. Magenta Therapeutics, Inc. (NASDAQ: MGTA) surged 12.03 percent to close at $10.52. Nightstar Therapeutics plc (NASDAQ: NITE) rose 11.98 percent to close at $15.89. StoneCo Ltd. (NASDAQ: STNE) shares gained 11.77 percent to close at $29.35 on Monday. 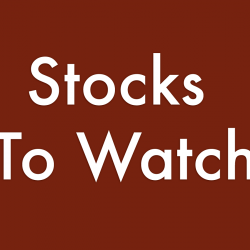 Rocket Pharmaceuticals, Inc. (NASDAQ: RCKT) climbed 11.63 percent to close at $16.61. Homology Medicines, Inc. (NASDAQ: FIXX) gained 11.47 percent to close at $27.02. Audentes Therapeutics, Inc. (NASDAQ: BOLD) shares rose 11.38 percent to close at $29.26 in sympathy to Roche's acquisition of Spark Therapeutics and an upgrade from Neutral to Buy from Chardan Capital. Anaplan, Inc. (NYSE: PLAN) gained 10.3 percent to close at $36.83 after reporting Q4 results. Orchard Therapeutics plc (NASDAQ: ORTX) shares climbed 9.77 percent to close at $17.52. Solid Biosciences Inc. (NASDAQ: SLDB) rose 9.6 percent to close at $9.82. Danaher Corporation (NYSE: DHR) gained 8.52 percent to close at $123.15 after the company announced it would buy General Electric's Life Sciences business for $21.4 billion and that the acquisition would be accretive to adjusted earnings. Summit Wireless Technologies, Inc. (NASDAQ: WISA) shares rose 8.23 percent to close at $2.50. Carter's, Inc. (NYSE: CRI) rose 8.12 percent to close at $100.03 following upbeat Q4 results. Wayfair Inc (NYSE: W) gained 6.89 percent to close at $160.28 after multiple banks reiterated the company's stock with positive ratings following a strong Q4 earnings beat. Westinghouse Air Brake Technologies Corp (NYSE: WAB) gained 6.41 percent to close at $78.06 following Q4 results. General Electric Company (NYSE: GE) shares gained 6.39 percent to close at $10.82 after the company agreed to sell its BioPharma business to Danaher Corporation (NYSE: DHR) for $21.4 billion. Amicus Therapeutics, Inc. (NASDAQ: FOLD) gained 5.87 percent to close at $12.44 after the FDA granted breakthrough therapy designation to the company's AT-GAA. Jianpu Technology Inc. (NYSE: JT) rose 5.83 percent to close at $6.54 after reporting upbeat Q4 results. Voyager Therapeutics, Inc. (NASDAQ: VYGR) rose 5.64 percent to close at $13.86 on Monday after surging 22.85 percent on Friday. Editas Medicine, Inc. (NASDAQ: EDIT) rose 5.33 percent to close at $20.93. Windstream Holdings, Inc. (NASDAQ: WIN) shares dipped 46.89 percent to close at $0.4530 on rumors of the company declaring bankruptcy. Achieve Life Sciences, Inc. (NASDAQ: ACHV) shares tumbled 19.7 percent to close at $2.65 on Monday after rising 82.32 percent on Friday. Synergy Pharmaceuticals Inc. (NASDAQ: SGYP) shares declined 17.21 percent to close at $0.2401 following late-Friday Dow Jones report that the companywon court permission to draw down remainder of a $155 million bankruptcy financing package. Sunlands Online Education Group (NYSE: STG) shares fell 17.18 percent to close at $4.05. Travelzoo (NASDAQ: TZOO) dipped 14.12 percent to close at $12.71. Harpoon Therapeutics, Inc. (NASDAQ: HARP) shares fell 14.06 percent to close at $14.36. Tyme Technologies, Inc. (NASDAQ: TYME) dropped 12.37 percent to close at $2.62. eHealth, Inc. (NASDAQ: EHTH) dropped 11.36 percent to close at $56.25. Ramaco Resources, Inc. (NASDAQ: METC) fell 10.64 percent to close at $5.29 after reporting preliminary 2018 results. Dorman Products Inc. (NASDAQ: DORM) declined 10.42 percent to close at $81.27 after the company issued weak FY19 earnings forecast. Textainer Group Holdings Limited (NYSE: TGH) dipped 10.38 percent to close at $11.40. Research Frontiers Incorporated (NASDAQ: REFR) tumbled 9.83 percent to close at $2.11 on Monday. Overstock.com, Inc. (NASDAQ: OSTK) dropped 9.2 percent to close at $18.06. Riot Blockchain, Inc. (NASDAQ: RIOT) shares declined 9.11 percent to close at $3.59. Melinta Therapeutics, Inc. (NASDAQ: MLNT) shares dropped 9.02 percent to close at $5.95. Blink Charging Co. (NASDAQ: BLNK) shares tumbled 8.83 percent to close at $3.20. Kandi Technologies Group, Inc. (NASDAQ: KNDI) dropped 8.54 percent to close at $8.25. Cronos Group Inc (NASDAQ: CRON) fell 7.62 percent to close at $20.25. Analysts at Jefferies initiated coverage on Cronos with an Underperform rating. B.O.S Better Online Solutions Ltd. (NASDAQ: BOSC) shares fell 5.4 percent to close at $3.33. BOS Better Online Solutions posted Q4 earnings of $0.11 per share on sales of $9.1 million. OncoCyte Corporation (NYSE: OCX) fell 5.19 percent to close at $3.47 after declining 8.50 percent on Friday.